Why Such a Dislike and Lack of Adoption for the Unity Desktop? Re: Why Such a Dislike and Lack of Adoption for the Unity Desktop? Unity is the main reason people are leaving Ubuntu, I dislike it and the Metro interface of Windows 8. Give me choice: classic shell to bring back the start menu for Windows and LXDE for Linux. This has been an interesting conversation. All I can tell you is that I find the entire phenomenon of Ubuntu and its various derivatives fascinating. And, from what I can see, Ubuntu's GNOME-based Unity desktop environment is, as emegra has said, the flagship distribution within Linux. 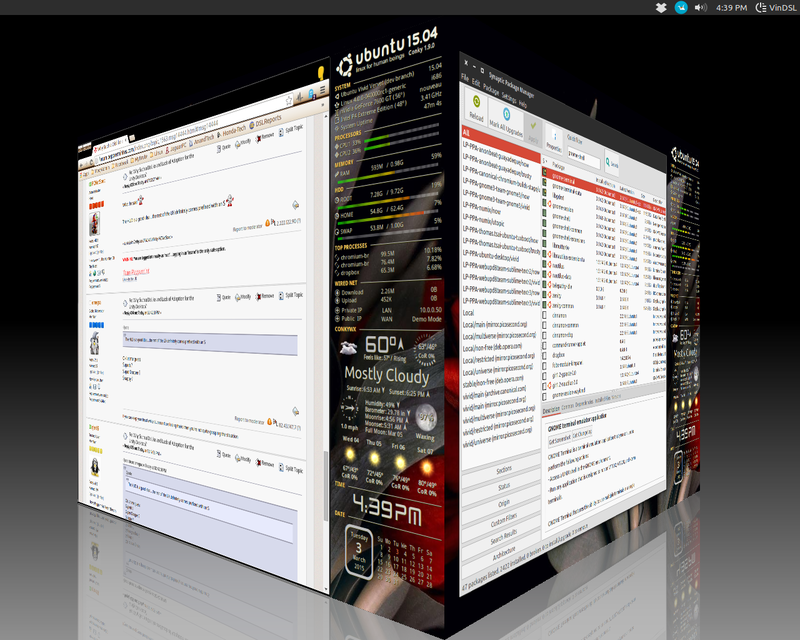 And what makes Ubuntu's Unity DE so interesting is that it is both brilliant and flawed. Many here have said they don't like the lack of customization options within Unity. Those here who say this are right about that. There isn't much one can customize in Unity. If however one likes the way Unity is preconfigured, then the end user is all set. My wife and I fortunately fall into this latter category. Unity's DE is very easy to use. I should note I have so far found Trisquel, which is another GNOME-based Ubuntu derivative, and the FSF browser that Richard Stallman uses, to be completely un-user friendly. He would say I'm valuing convenience over privacy and freedom. But, I would say I need a distribution that works well and values privacy and freedom. Even Chromium browser, the last I knew, was considered unacceptable by Trisquel and the FSF. In my opinion, that's pushing a principle a little too far -- principled to a fault! At the end of the day, the two most user friendly Linux distributions I've ever used are Ubuntu's Unity and Peppermint OS. In this house, we've got two Peppermint installations and one installation of Unity. And although my wife enjoys Ubuntu's DE, she prefers and runs Peppermint on her computer. I run both Peppermint and Unity*. Peppermint is easy to use, customizable, and fast. Unity is easy to use, quite intuitive, and getting faster all of the time -- despite its bloatware! Perhaps PCNetSpec hit the nail on the head when he mentioned Canonical's boardroom. A little more listening to the valid concerns of Ubuntu's loyal and true users would be helpful in the development, and adoption, of Ubuntu's Unity DE. Time will tell what direction Unity will go from here. If what I'm saying is so; why such a dislike for Unity? * This dislike of Unity within the Linux community seems almost visceral to me. And only a few distributions, if that, have adopted Unity as a desktop environment. * The privacy issues of Unity can turned off with a couple of clicks. And, as for sluggishness, Unity appears to be getting faster and faster with each release. I've been finding Unity within Utopic Unicorn to be terrific. Unfortunately it only has several more months of support. Also one can easily uninstall Amazon. i dont care for all the 'bloat' as was said above i also dont liek the side dock i think its just ugly in my opinion. a bit too much for my taste. I'm not trying to sell you on Unity, but you can hide the side launcher within Unity if you want. You go into System Settings > Personal > Appearence > Behavior > Auto-hide the Launcher > Turn from Off to On. As for the bloat; well you can remove Amazon, from within Ubuntu's Software Manager, and you can go into Security & Privacy and turn a couple things off in Search and Files & Applications. But, yeah, Unity is pretty well stuffed with programs and plugins. i honestly dont ever see changing distros. but it is good to know i can remove that ugly side bar. Right now, I'm giving GNOME another try. When I talk about GNOME, I want to be able to give it a fair assessment. In case you didn't see it, I edited the very first post of this discussion. I put a link in for you at the end of the very first post. In that YouTube Video Nixie Pixel compares and contrasts GNOME Shell with Unity. I put the link in code format for you as well as in a ready-to-go video format for the rest of Peppermint Nation and our guests. You may find what Nixie Pixel says concerning GNOME and Unity interesting.